If you use the Performance Management Chart (PMC) on TrainingPeaks web or mobile app, you are familiar with Chronic Training Load (CTL). It’s a rolling, daily average of how much training load, measured by each workouts Training Stress Score® (TSS®), an athlete is managing. The more stress you can handle the greater your fitness is likely to be. If your CTL is rising then fitness is likely rising also. So CTL is a good proxy for “fitness” in the PMC model. A common question I’m asked is how rapidly the CTL should rise over time. In other words, what should my ramp rate be? 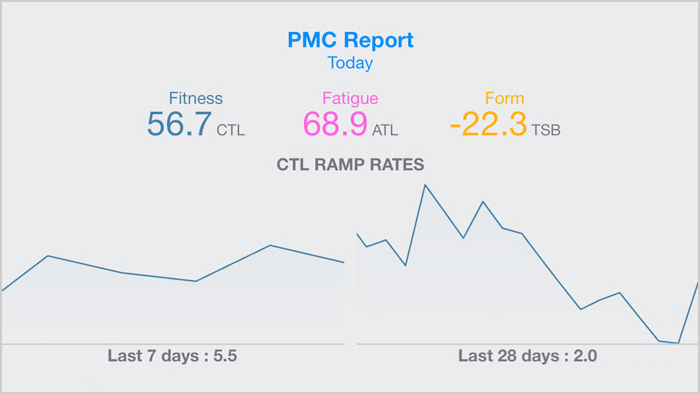 Ramp rate is now shown in the mobile app in the PMC Report chart for all Premium members. Obviously, if it doesn’t rise at all then fitness is probably stagnant. If you reduce your training load, your CTL will drop indicating a loss of fitness. This is called negative ramping. A lot of zeroes back to back, meaning missed workouts, quickly lowers your CTL indicating without a doubt a loss of fitness. But most athletes want to know how rapidly CTL can be increased without producing negative consequences such as overtraining, illness, or burnout. A key point to understand about these consequences of training too much is that they each take time to produce, usually several days if not weeks. They don’t happen overnight, or even in a few days. Most require a few weeks before they begin to show up. How rapidly this happens is quite an individualized matter that depends on many factors such as typical training loads, age, experience in the sport, fitness level, and more. A reasonable ramp rate is one that you maintain for a few weeks before taking a break for a few days. While it depends to a great extent on who the athlete is, I’ve found that an increase in CTL of about 5 to 8 points per week is about right for most. Less than that and you’re probably not very focused on your training. More than that and you’re starting to get into the crash training load range. Some unique athletes are able to manage a very high ramp rate, such as greater than 10 CTL points per week, for a fairly long period of time before breaking down in some way. Such athletes are often at the elite level. While it’s not a good idea to try to find your limits, what you can manage without breaking down is generally determined by trial and error. This may result from participating in a high training load camp with other highly motivated athletes. While it’s a little harder to drive yourself to the same extent, you could also do high load training on your own. Regardless, it’s wise to keep such a high ramp rate to a week or less before backing off to rest and recover. I call such a short period at such a high ramp rate a “crash” period. This typically results in a greatly increased level of fitness after a few days of post-crash rest and recovery. If you go much beyond a week at 10 or more weekly CTL ramp rate and the outcomes aren’t likely to be as beneficial. That’s one of the things that makes the Grand Tours in cycling such challenging events. When you do take a break for a few days your CTL will drop a bit since the training load is quite light as indicated by low TSS workouts relative to your “normal” training. But don’t let the falling CTL scare you away from recovery periods. They’re necessary if you are to reap the benefits of the recent training. Of course, there are other things lifestyle matters that may add to the stress of training and reduce your capacity for a moderately high CTL ramp rate. Some of the greatest lifestyle stressors are divorce, moving, financial difficulties, and changing jobs. These are the big ones, but having a lot of lesser ones in your life can be just as challenging. Any of these scenarios can reduce your capacity for training meaning that your ramp rate must be adjusted downward to maintain your health and well being. If this is the case then training must be reduced regardless of what your weekly rate of CTL ramping may be.